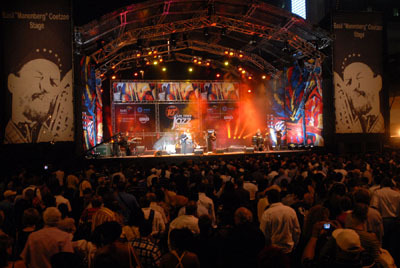 CAPE TOWN, South Africa — The 2009 Cape Town International Jazz Festival has emerged as a major event, drawing 60,000 over two days to the Cape Town International Convention Centre. The challenge for Gearhouse South Africa, which has serviced the event since its inception in 2000 and handles lighting, AV, staging and power for its three main stages with a production crew of 40, is to top the previous year’s production. “A constant challenge has been to keep coming up with new ideas to keep it looking fresh and different each year,” said GHSA international sales manager Philip Beardwood, who worked with onsite project manager Theo van As and GHSA’s main production designer Phil Chames to help the different companies within GHSA keep everything running smoothly. At the main Kippies stage, which can handle a crowd of 10,000, GHSA installed a 10-by-14-meter stage and related structures including camera platforms, wheelchair access and risers. GHSA’s sister company, Havaseat supplied a 1,500 VIP seating area at the back of the hall. Headliners included leading international and African artists like Ringo Mandlingozi, Jonathan Butler, Freshly Ground and the Stylistics. The lighting rig was a 12 leg ground supported rig with six flown trusses. The spec contained 36 Martin Professional MAC 2K moving lights — a mix of Profiles and Washes, and eight Robe ColorWash 700E ATs, with a large generic rig of PARs, ACLs, ETC Source Fours and fresnels. These were complemented with a variety of effects like Atomic strobes and smoke, all controlled from a WholeHog iPC console operated by Philip Chames. The basic design idea for all the GHSA stages was to make the performance spaces as flexible as possible, offering a wide range of visual options and different looks to the various artists appearing, some of which brought their own LDs. The projection system incorporated a Stumpfl 6-by-4.5 meter screen upstage, fed by two rear projected Christie 8K machines, with a Folsom Image pro hard disk and a DVD player for sources. The second stage, Basil Mannenburg Coetzee, accommodated an audience of 6,000 audience and featured a line-up including Ndumiso Nyovane, Shakatak and Incognito, among many others. GHSA built a 16-by-12-meter structure for the stage along with camera platforms and viewing decks. Lighting was again designed for multiple performances and quick turnarounds, with 18 Robe ColorSpot and ColorWash 700E AT moving lights, backed up with a mix of generics, all run through a Hog 1000 desk by Willie Bothma. The third area, the Bassline stage, was located on one of the exterior lawns opposite the CICC, serving an audience of up to 3,000. The lighting rig included Martin MAC 250 Wash fixtures and 250 Entours, PARs, profiles and fresnels, operated by Hilton Carelse. For more information, please visit www.gearhouse.co.za.